Spurred by the Project to Rescue Cultural Properties Damaged by the Tohoku Earthquake and Tsunami (Project to Rescue Cultural Properties), the National Research Institute for Cultural Properties, Tokyo will provide logistical support via its Secretariat located in Tokyo and coordinate with the Agency for Cultural Affairs and other relevant institutions and organizations. A specific series of emergency measures must promptly be established (in a manual) to rescue damaged cultural properties in a variety of potential situations. When cultural properties are damaged by water from a tsunami, water damage, salt damage, and biological deterioration due to microorganisms (e.g. mold) should be limited as much as possible. Efforts should also be made to devise responses using materials and infrastructure available on-site in order to facilitate subsequent restoration of those properties. Several types of efforts should be explored. Information should be shared with relevant individuals, institutions, and organizations involved in rescuing those properties and information should be provided to the site of the disaster. 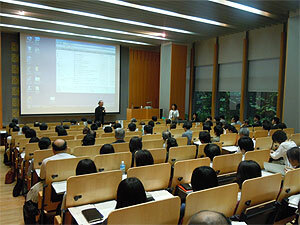 As a first step, a conference to share information was held on May 10, 2011 at the National Research Institute for Cultural Properties, Tokyo. The topic of the conference was Expanding Choices in Initial Efforts to Rescue Damaged Cultural Properties: Limiting Biological Deterioration as Much as Possible and Preparing for Later Restoration. This conference featured issues raised by Isamu Sakamoto, who was actively involved in efforts to rescue damaged cultural properties on-site during the Northern Sumatra earthquake, Toshiharu Enomae, who studied the incidence of mold on paper immersed in seawater, and Hiromi Tanimura, who studied use of the squelch drying technique as a way to rescue damaged cultural properties during recent floods in Europe. Experts in various fields were invited to comment, notes on initial responses for different materials were provided, and views were presented. In addition, the conference featured a demonstration of the squelch drying technique and sample paintings immersed in salt and salt water. Thanks are expressed to the experts who participated and to the 161 attendees who participated in the enthusiastic discussion throughout. Hopes are that this information will prove of some use at rescue sites. 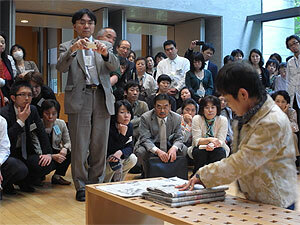 Materials from the conference were made available at the National Research Institute for Cultural Properties, Tokyo website http://www.tobunken.go.jp/~hozon/rescue/rescue20110510.html on May 17.